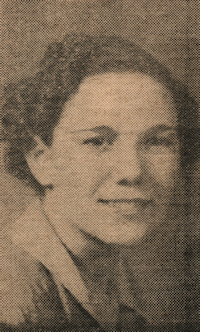 Obituary – Boone, Imogene Bernice « Perry High School Alumni Association, Inc.
– daughter of Mr. and Mrs. Frank Boone of Perry was born in Perry on July 14, 1919 and attended the elementary grades in Perry and high school in Oklahoma City and Perry. Following graduation she expects to take a business course. Imogene Bernice Boone, 84, was the daughter of Robert F. and Pearl Dodd Boone. She was born July 14, 1919 at Perry, Oklahoma and died at 5:35 a.m. Wednesday, August 20, 2003 at Perry Memorial Hospital. Funeral services will be at 10:00 a.m. Saturday, August 23, 2003 in the chapel of Brown-Dugger Funeral Home of Perry. Rev. Martin Foster will officiate. Interment will be in Grace Hill Cemetery at Perry. Memorial contributions may be made to the First Christian Church in care of Brown-Dugger Funeral Home. Imogene was a United States government civil service employee who worked for the draft board at St. Louis, Missouri before retirement. She moved back to Perry nine years ago after living the majority of her life in St. Louis. She was a member of the First Christian Church and the Hope Circle. Survivors are one brother, Robert L. Boone, Bull Head City, Arizona; five nephews, Don Lowry, Jerry Lowry and Robert Lowry, all of Perry, Oklahoma, Vic Brenaman, Englewood, California, and Ken Yarger, Oklahoma City, Oklahoma; and five nieces, Jean Houska, Cindy St. Clair and Linda Watson, all of Perry, Oklahoma, Connie Knight, Redlands, California, and Valerie Sagi, Englewood, California. Her parents and three sisters, Helen Yarger, Thelmalene Lowry and Velta Brenaman, preceded her in death.